After over 100 years of linguistic repression by the government, Hawai’i amended its constitution and mandated in Article X, Section 4 the designation of Hawaiian language as one of the two official languages of the State of Hawai’i. Around this same time (1980) it was estimated that there were fewer than 50 Hawaiian language speakers under the age of 18 and that Hawaiian was a dying language. A few years later (1984) due to lobbying efforts from Hawaiian families and community leaders, who were interested in increasing the number of young Hawaiian language speakers, the State removed the ban on the use of Hawaiian as a medium of education in Hawai’i schools. The Hawai’i State Board of Education approved the formation of the Papahana Kaiapuni ‘Ōlelo Hawai’i (Hawaiian Language Immersion Program), and the first two pilot Hawaiian language Immersion Department of Education sites were established at Waiau Elementary School on O’ahu and Keaukaha Elementary School on Hawai’i island. In 1989, the Hawai’i Board of Education approved these two Hawaiian Language immersion programs as limited K-6 programs. As haumāna at these two programs moved up in grade levels, proponents pushed for the development of additional grade levels all the way up to grade 12, and permanent facilities to support this. For the Keaukaha program, supporters and leaders were able to secure permanent facilities in Kea’au at what is now Nāwahīokalani’ōpu’u (Nāwahī). Initially, Nāwahī was the home of the immersion school site for haumāna in grades 7-10 (to be grade 12 in 1999). While the site was large enough to support the entire M-12 immersion program many kumu and ‘ohana felt it was necessary to remain in Keaukaha because of its location in a Hawaiian homestead community and its proximity to coastal resources. As such in 1997, an additional elementary immersion school was developed at Nāwahī. Some kumu and ‘ohana, from the Keaukaha program, made the move to Ke Kula o Nāwahīokalani’ōpu’u and others stayed. A group of Ke Kula Kaiapuni O Keaukaha kumu, ‘ohana and community members developed an Implementation Plan to become a charter school under the new State of Hawai’i Charter School program, and Ke Kula Kaiapuni O Keaukaha became Ka ‘Umeke Kā’eo Hawaiian Immersion Public Charter School (Ka ‘Umeke). Despite the change from a DOE school to a charter school, Ka ‘Umeke continues to receive free resources (books, posters, curriculum materials) and services through Hale Kuamo’o and the University of Hawai’i at Hilo. Additionally, it allowed the school community to have more autonomy over the educational program at Ka ‘Umeke. Over the next nine years, Ka ‘Umeke underwent incredible growth increasing each grade level to two classes of no more than twenty-four haumāna beginning at Papa Mālaa’o. Ka ‘Umeke grew to include the first Papa ‘Ehiku, and committed to increasing one-grade level each year after. In 2013-2014 Ka ‘Umeke will have its first graduating class. This growth into middle and high school has been a challenge for Ka ‘Umeke in terms of our educational program and facilities. Under Poʻokumu Huihui Kanahele-Mossmanʻs leadership Ka ʻUmeke Kāʻeo refined its focus to include, along with language preservation, the cultural learning methodology called Papakū Makawalu. 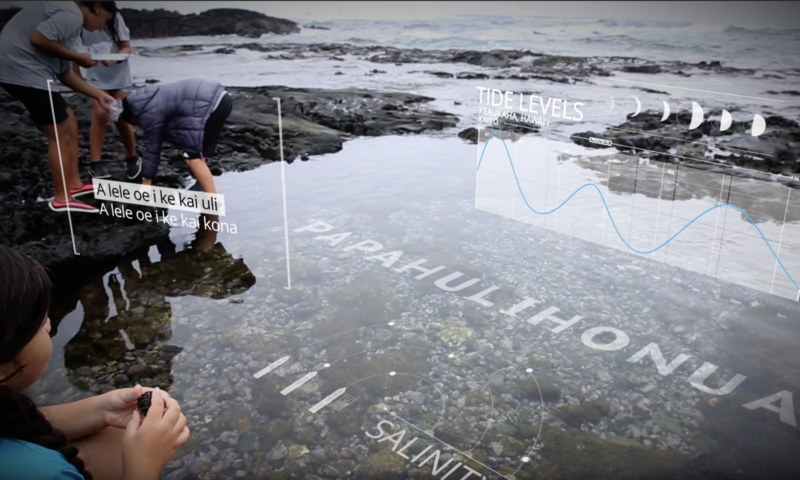 The utilization of the Papakū Makawalu methodology take us back to the mole (root) as it requires fluency in Hawaiian language and necessitates the development of that language to express scientific observation, data collection, and analysis as well as the language skills necessary to compose and communicate these observations into traditional information dissemination practices such as mele and oli. Hawaiian language remains essential to meeting Ka ‘Umeke’s educational vision and the new focus should not be viewed as a shift away from language preservation but a focus on language acquisition for inquiry learning. Hawaiian language arts is taught exclusively in Papa Māalaa’o through Papa ‘Ekolu and then in Papa ‘Ehā haumāna are introduced to the instruction of English Language Arts this and continues until Papa ‘Umikūmālua. Ka ʻUmeke becomes accreditated under HAIS and WASC. Additionally, the school adopts Papakū Makawalu methodology schoolwide. Ka ʻUmeke closes itʻs high school. Data showed that in 2014, at our peak of enrollment, our high school had a student body of 25 students in grades 9-12. Over the last couple of years we have seen this number steadily decrease and in the 2015-2016 school year (the last year before we suspended our program) our high school was made up of nine students (4 grade 9, 3 grade 10, 1 grade 11, 1 grade 12). In late February 2016, a survey went home to all students regarding their intent to re-enroll for the 2016-2017 school year. Based on this survey our projections suggest that high school enrollment would likely be 15 or fewer students in 2016-2017. We attribute low enrollment to a number of factors including the high attrition rate experienced at Hawaiian Immersion High Schools across the State, significant numbers of students leaving to attend Kamehameha School (typically 6th graders and 9th graders), the desire of students for increased social experiences and extracurricular activities that are more readily available at larger schools, and parents who perceive the program to lack rigor in terms of preparing their children for post-secondary studies (in actuality out of a total 14 graduates, 11 have gone on to pursue post-secondary studies). With such low student numbers, it is difficult to financially maintain the staff to support the kind of program we would like to have at Ka ‘Umeke Kāʻeo. Another factor contributing to the decision to suspend the high school program is the need to engage the larger school community in a planning process. Since the roll out of the high school in the 2010-2011 school year, there have a number of challenges at Ka ‘Umeke that have prohibited the development of a strong high school program. This includes time for the entire school community to build a feeling of ownership of the high school program, changes in leadership, difficulty retaining and recruiting teachers that have both Hawaiian language skills and are highly qualified to teach secondary school, and finding appropriate facilities. We recognize that we need to take the time to develop and articulate a program that reflects our mission and vision and identify and hire staff that has the skills to implement it. This one-year suspension will enable the school community to rebuild the high school program, identify and secure community resources and partnerships, identify magnet teachers (strong teachers who attract other strong teachers and families to the program), engage families, and recruit students.